Vibration analysis (VA) is an industry condition monitoring technique used in the asset management industry for early failure detection. By means of a handheld analyser with an attached accelerometer probe. Online continuous monitoring with permanently mounted probes. 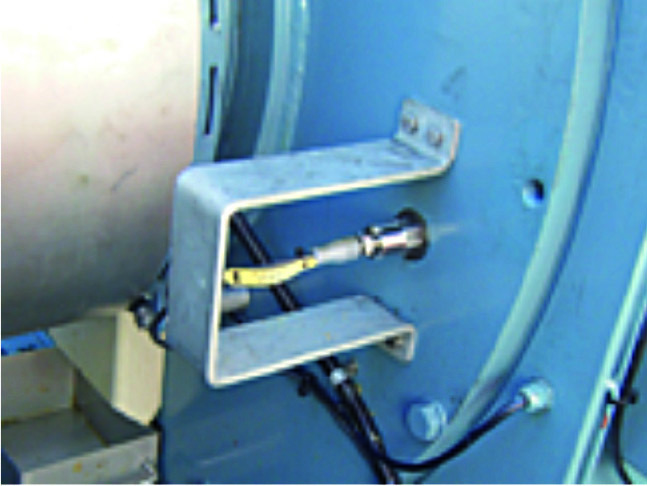 The former is used for smaller plants and agile asset monitoring like smaller pumps, motor fans and others, while the latter is mostly used for critical and large, expensive components or remote assets such as offshore wind turbines (see Fig. 1). Fig. 1: A present-day standard accelerometer used for online vibration monitoring. Connectivity: Connectivity is limited to how many sensors we have, how we communicate with them and how we share the analysis results. The cost of sensors, new analysers and the software to process the information is significant and research and development in these fields is expensive. Cost: The labour cost of these skills is worth mentioning as training requirements are extensive. 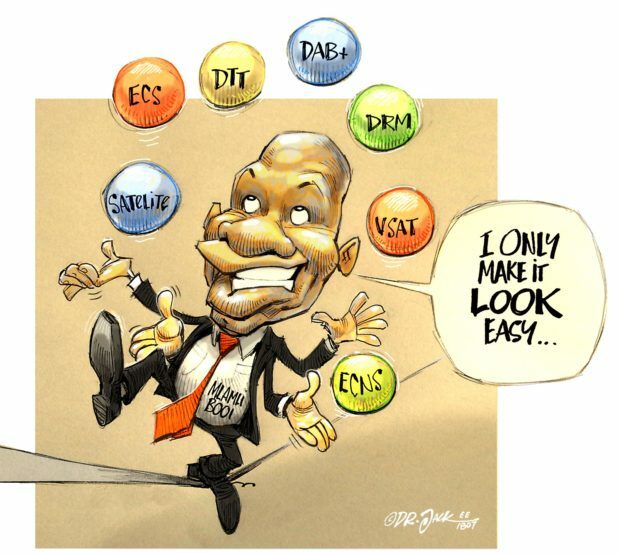 Signal analysis is a complex field while the many forces acting on a single component make VA a difficult skill to master, often requiring many years’ experience. Accuracy: The time required to become a specialist in the field also influences the accuracy of diagnosis. 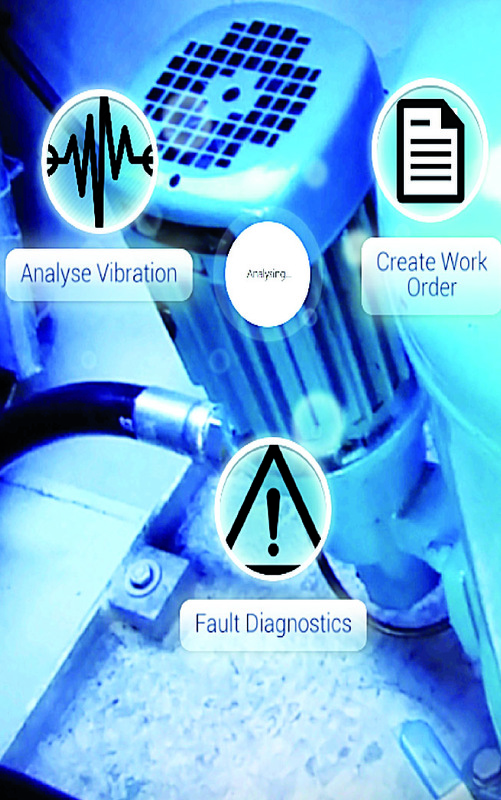 Inaccuracies are often the greatest pitfall of a solid vibration analysis programme. Visualisation: Visualisation of the signal makes it hard to identify the fault, and further visualisation difficulties, from the analyst to the customer (internal or external), which usually require a report of some sort, are apparent when the asset owners have limited understanding of the fault or potential fault. Analysing these signals often involves a certain level of confidence and this variability in diagnosis can be difficult to convey in a report. Many technologies have emerged in the last decade. These emerging technologies are developed and tested and, in many cases, are mainstream in other industries, implying that it is possible to apply them to VA, and we therefore redefine the way we analyse machines. The technologies that we are particularly interested in here are sensors and nodes (making up the Internet of Things); modelling; machine learning and artificial intelligence (AI); robotics and optical accelerometers. We now look at these in more detail. A great example of these technologies not only working together but specifically in the VA industry, is a start-up company which has created its own data collection device, connected it to a smart phone and, using proprietary machine learning algorithms, is able to diagnose faults in real time. This removes the need for intensive technician analysis training, the weeks it takes to analyse the collected samples, and standardises the reports generated to help to democratise VA. Fig. 2: Current standard fast Fourier transform (FFT) spectrum of vibration on a gearbox. A closer look at the limitations mentioned here (which prevent innovation), we see that they have been overcome in other industries. Connectivity: Technology is now moving toward hyper connectivity. 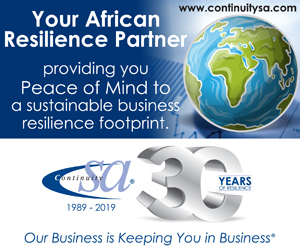 If we consider that, in 2010, 1,8-billion people were connected to the internet and in 2016 an estimated 3-billion people, and by 2022 – 2025, that number will expand to include every human on the planet, we realise that connecting people to the internet of things is no longer a limitation. Cost: The cost of digital technology is dropping and this, in effect, reduces the cost of the systems and hardware used for VA. In a 2003 presentation on vibration analysis, it was stated that 24-bit analogue to digital converters would greatly improve the capability of VA in the future. Just 15 years later, we can now buy these at a mere $24 from Amazon. Accuracy: Machine learning accuracy is beginning to trump specialist knowledge in many fields. AI can predict heart attacks more accurately than specialists do and the first AI appeared in court as a lawyer and another beat the world champion Go grandmaster board game, to name a few. Visualisation: The field of visualisation acts as the interface between the technology component and the human. This has, in many cases, been a limiting factor for technology adoption, especially early adoption. With virtual reality and augmented or mixed reality becoming a mainstream technology, this new visualisation availability will very soon shift into the VA industry too and change the interface used completely. 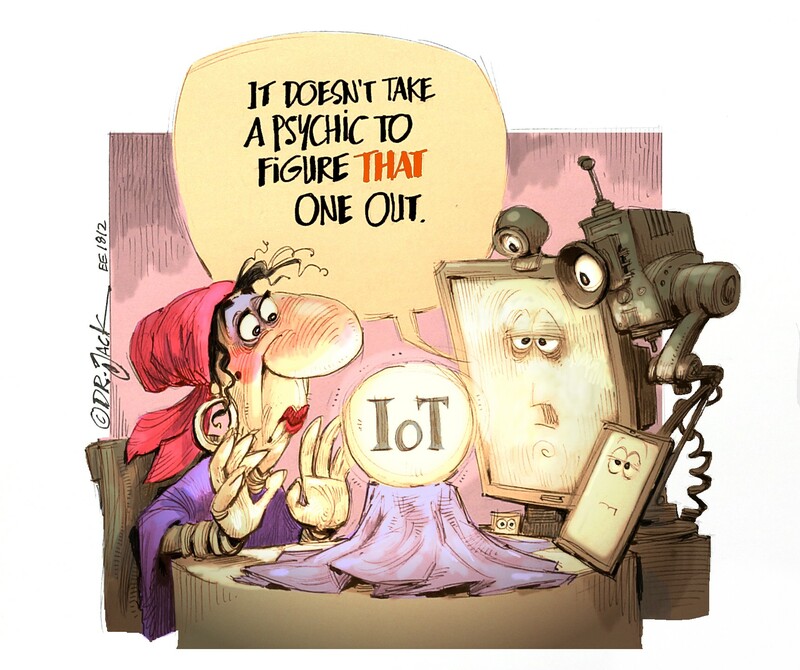 If we couple all of these new technologies, we can determine the next step for VA. The next logical, albeit linear step for VA is the use of remote laser sensors, machine learning diagnosis and augmented display – all in real time. This is a major step which allows us to not only know instantly the ailment of a machine, but also to visualise this fault type or failure mode enabling rapid root cause analysis and repair. Fig. 3: Augmented reality as interface for automated fault diagnostics in real time. To prove that this technology is not in the distant future, but rather in one to three years’ time, Fig. 3 shows an interface design showcasing this easy-to-understand scenario. Imagine the future of VA over the next decade. This requires some imagination as ten years is a long time, especially with the exponential growth we’ve seen in technology and when bearing in mind that the human brain is designed to think linearly. 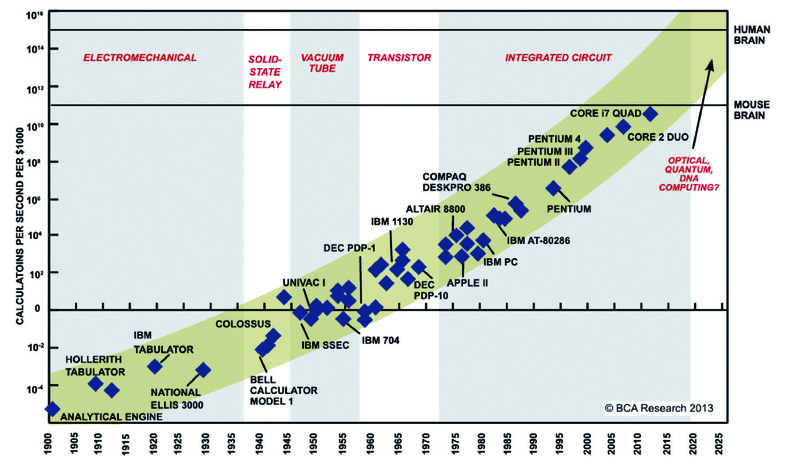 The sole driver used to measure growth in the digital world is undoubtedly Moore’s law, which refers to an observation made by Gordon Moore in 1965 when he noticed that the number of transistors per square inch on integrated circuits had doubled every year since their invention(see Fig. 4). This growth is predicted to continue in future. VA, like many other technologies, has become digitised, meaning that it too obeys Moore’s law. It is set for unprecedented developments in the near future and will be unrecognisable in ten years’ time. Given the extreme growth rate we are likely to see in the not-so-distant future, what likely concept is going to evolve from VA? The most likely scenario is a concept which removes the need for VA completely. 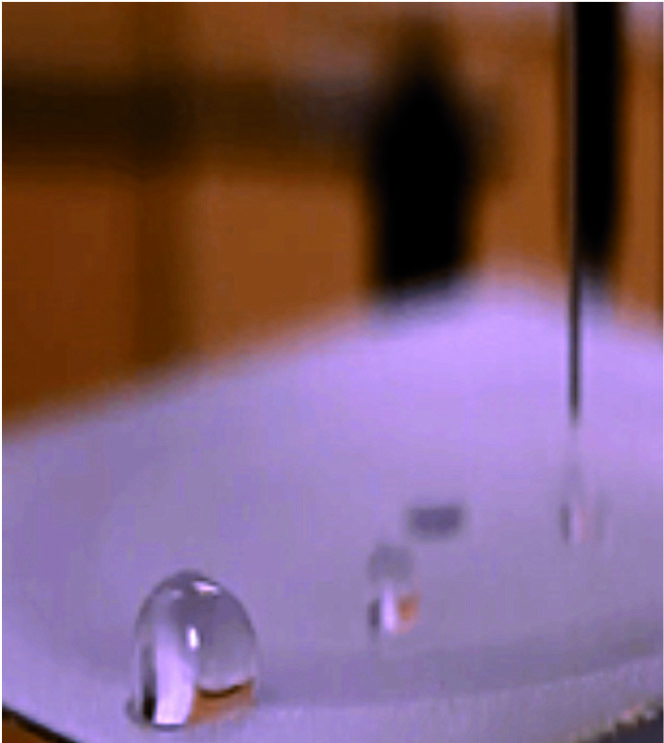 This can be in the form of self-healing materials or by removing the source of vibration and friction all together. The latter has already been developed with magnetic levitation in the rail industry. This innovation could remove the need for bearings and gears altogether. The removal of bearings might sound decades away, but considering a recent development where a team at the University of Michigan created a self-healing, water repellent coating that can be sprayed onto virtually any surface. This coating was created by redefining the fundamental microscopic geometry of the material, which makes it resilient against abrasion, scratches, chemicals and mechanical stresses, as it can heal itself hundreds of times. In the first instance an application could be an outer coating eliminating corrosion, but it doesn’t require much to imagine bearing surface coatings, repairing spalling, rubbing and cutting wear, and allowing for the repair of the root cause. 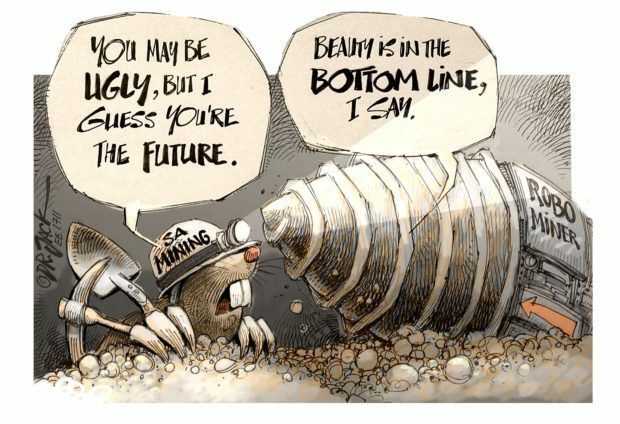 So, perhaps the future isn’t as far away as we think (see Fig. 5). There is no question that these upcoming technology shifts will drastically change the way we work. Not only will it change the way we monitor and analyse our assets, but it will fundamentally shift the way we interface with the assets. Though this might sound unfavourable in relation to our current roles, it should rather be viewed as a shift towards additional, more rewarding responsibilities. Innovation is still a natural part of the product life cycle and will likely be in the form of a smarter vibration pen with all bearing fault frequencies preloaded, a super-fast data collector and analyser or, most likely, the software side with automated and more accurate analysis. Once this happens, there will be a fundamental shift in the way things are done – a disruption – and this is where investment is paramount. The earlier we adopt these technologies, the more time we’ll have to learn, and so the easier the transition will be and, most importantly, the more influence we’ll have in terms of its development. Traditionally, VA closely follows the P point on a P-F curve, alongside lubrication analysis because, as a condition monitoring technology, it is relatively sensitive to small changes (see Fig. 5). 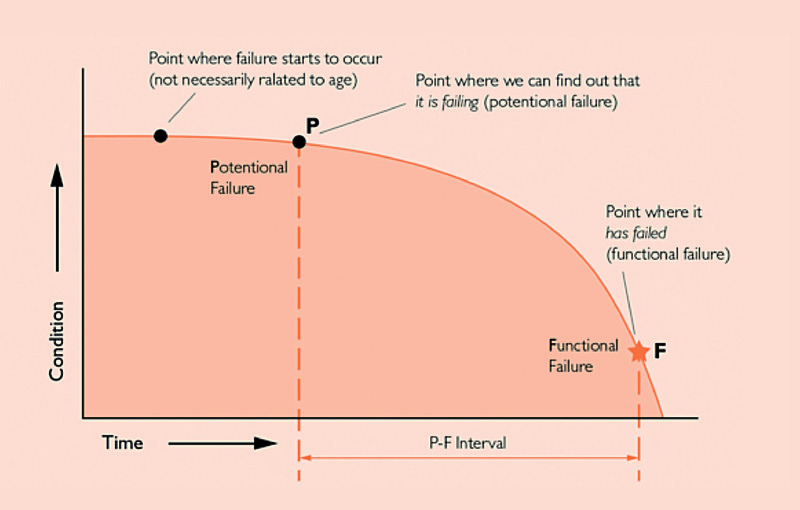 Although vibration only occurs when a specific component has degraded to the point of permanent deformation, and considering that future predictive maintenance will be the standard point P on the curve, it is suspected that the point where vibration will only occur once a failure has occurred will be considered the F point when failure occurs. This is similar to how temperature limits are used today in emergency stops (point F on the curve). Detecting a fault with VA will be the last line of defence in the future, firmly cementing its place as a condition monitoring technology, likely fully automated and integrated. water-repellent coating. Source: Jason Goodwin and Peter Diamandes, Abundance Insider April 14, 2017. The face of engineering will most certainly change with the advent of artificial intelligence, abundant sensors, robotics and 3D printing. These stakeholders will have more responsibility and an overarching role in asset management. We’ll likely monitor the systems that monitor the assets, freeing up valuable resources to tackle new challenges and developments. The exciting times for these roles is now, when all these technologies are set to converge, to affect and disrupt each major industry, especially condition monitoring and vibration analysis. Our input is most valuable and influential right now, in defining how this interaction between man and machine will occur. We get to decide how it works, who is responsible for what task, and to identify these efficiency gains of total automation. It is our responsibility to use these powerful technologies to define our own future. We’re using old, dated technology for VA that has already been disrupted. Change is upon us and these new technologies will penetrate asset management within the next three years. Vibration analysis, technicians and engineers have a firm future in asset management as a whole and, five to ten years from now, our roles will have changed significantly – for the better. Algorithms will be refined further, analysis will be more accurate and the efficiency of VA programmes will increase greatly. We’ll see machine learning and artificial intelligence integrating into VA and allowing it to be applied to any asset across the plant. Fig. 6: The P-F curve . Remember that these new technologies are not bleeding edge and should not be feared. They have been years in the making, improve continuously, and will eventually overtake existing methodologies and allow us to leap into the future. Abraham Lincoln said, “The best way to predict the future is to create it”. Now let us create the future we want. This article was published by APT Publications Australia (www.powertrans.com.au) in the October-December 2017 issue of Industrial Electrix magazine, and is republished here with permission. DLI Azima: History of Vibration Analysis:, http://azimadli.com/vibman/historyofvibrationanalysisusedfor machinerymaintenance.htm .Accessed on 4/5/2017. G Boon, K de Bauw, “A journey through 30 years of vibration analysis on large turbines: a history of progress in technology and experience”, Conference on Noise and Vibration Engineering (ISMA2012) 17 – 19 September 2012. René Archambault: International Measurement Solutions, Baie d’Urfe, Quebec, “The past, present and future of vibration analysis”, 2003 conference of the Canadian Machinery Vibration Association (CMVA), Nova Scotia, Canada. Ray Kurzweil: The singularity is near: When humans transcend biology, p67, The Viking Press, 2006. Dale R Blann: Maximizing the P – F interval through condition-based maintenance, October 2013, www.maintworld.com/Applications/Maximizing-the-PF-Interval-Through-Condition-Based-Maintenance, accessed: 4 May 2017. Microsoft NZ: www.microsoft.com/en-nz /hololens, accessed 5 May 2017.